Visitors increased by 18%, with three times more foreign visitors this year. 9,000 professionals attended the saie academy training courses. The president Campagnoli: "we dedicate these 50 years of success to all the workers on italian building sites and those who have the right to hope to return to work". Over 60,000 visitors to the construction and building site Pavilions of the 50th SAIE, and 93,000 to the whole "platform" for the world of Italian construction, which for this edition was organized together with SAIE and the SAIE Sport, Saie 3, H2O, Expotunnel and Ambiente Lavoro shows. A SAIE that has returned to being international, with around 15,000 foreign visitors, accounting for 15% of the total visitors in 2014: a great leap from 5% in the 2013 edition. The foreign delegations arriving in Bologna have worked intensely: representing 21 countries, they took part in almost 1,000 B2B meetings with Italian firms interested in exporting. However, the return of foreign professionals to SAIE, a sign of renewed interest in Italy's productive capabilities, went way beyond these organized delegations, resulting in a significant increase in the total visitors and tripling the number of foreign visitors to the last edition. These foreign visitors came from over 90 countries, including France, Germany, Baltic States, Russia, Brazil, Spain, Turkey and Israel, returning to Bologna for an event that has made a comeback as a showcase for the best of the Italian construction industry and its leaders. SAIE at 50 was attended by all the big Italian firms in the sector, including Italcementi, Saint Gobain, Rubner, Velux, Colacem, Mapei, Acca Software. The 50th edition also saw the record presence of 1,408 exhibitors, including 208 from abroad, who occupied over 102,000 m2 of internal areas and the external areas housing large cranes and site machinery. 452 meetings, workshops and professional seminars were held by 2,581 speakers and professors. An amazing 41,257 people took part in the rich conference programme. This year the courses run by the SAIE Academy, in collaboration with the main Italian Universities and professional associations, were attended by a record9,000 people, who obtained official credits as part of their professional lifelong learning. 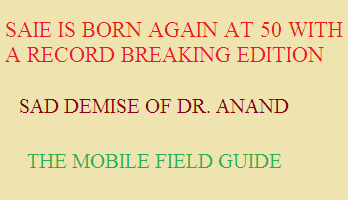 Dr. Anand, M/s. Anand Granites Exports Pvt Ltd, Ongole who was one of senior Life Member of Federation of Indian Granite & Stone Industry (FIGSI) and who use to support the activities of the Federation regularly in a big way passed away on 24th November 2014. M/s. Anand Granite Exports Pvt. Ltd. The National State Association (NSA) has launched a new Mobile Field Guide, based on its award-winning publication "State Roofs Design and Installation Manual". The Mobile Field Guide Focuses on the critical detailing needed to successfully install, repair and replace natural state roofs. It includes easy-to-read drawings of key roofing and flashing details that can be exploded (taken apart) and put back together again by simply sliding a finger along the slide bar at the bottom of the page. In this way, the user can construct each detail step-by-step. A brief set of explanatory notes and a cross-reference to the manual are provided for each detail. The new guide was developed to assist contractors, design professionals and building owners on the rooftop, or wherever they may be. It is available free of charge via the internet browser on a smart phone, or on a tablet wherever wi-fi is available.